Eight persons were confirmed dead while a pregnant woman and a child sustained injuries in an accident involving a blue Toyota Corolla Sport car around Ewekoro area on Lagos/Abeokuta expressway. Mr Babatunde Akinbiyi, the spokesperson, Traffic Compliance and Enforcement Corps (TRACE), confirmed the incident to the News Agency of Nigeria (NAN) in Abeokuta on Sunday. 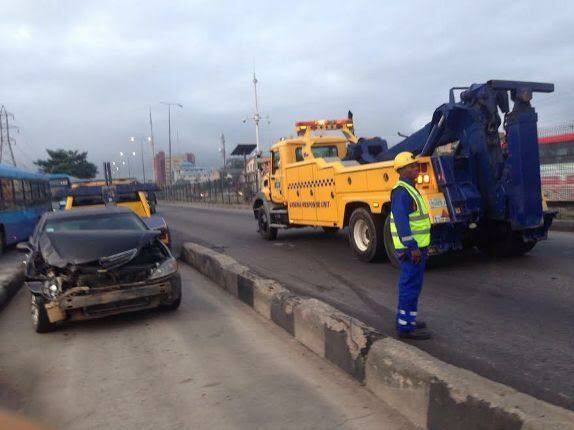 Akinbiyi explained that the accident which occurred around 12:50 p.m. was caused by excessive speeding and loss of control by the driver. He said that 10 persons made up of four males, four females and two children were involved in the accident that killed the eight persons leaving a pregnant woman and another person injured. “We learnt that the Toyota Corolla Sport vehicle was inbound Abeokuta on the Lagos/Abeokuta Expressway when the accident happened. “The driver of the Toyota marked AKD 649 FP, who was drunk and on excessive speed lost control of the vehicle and rammed into a stationery trailer parked on the road. “Though the driver of the trailer was not in the vehicle when the accident happened, he reported and is presently at Ewekoro Divisional Police Station with the vehicles involved,’’ he said. Akinbiyi said that the remains of the deceased had been deposited at the General Hospital Morgue in Ifo Local Government Area of the state. He said the injured pregnant woman and a boy were receiving treatment at the Federal Medical Centre (FMC) Idi-Aba, Abeokuta.